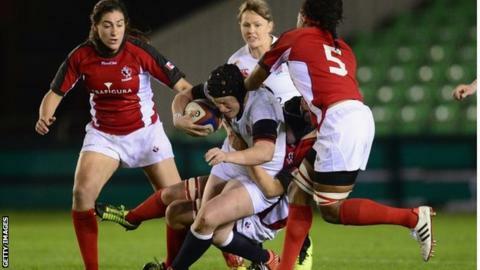 England Women followed up Saturday's victory over France with a 32-3 win against Canada at the Twickenham Stoop. Prop Sophie Hemming scored two tries while Lydia Thompson added another and Katy McLean kicked 17 points. It was England's first win against their opponents in three attempts, having been beaten twice in last summer's Nations Cup. "We've still got some players to come back so to perform like that is really pleasing," said coach Gary Street. "We've got a tough group out in France for the World Cup but our focus before that is the Six Nations." McLean kicked two early penalties to put England in control before Canadian fly-half Jackie Tittley responded to make it 6-3. But Hemming scored the first try of the match after 20 minutes when a line-out was gathered by Rowena Burnfield, who set up the Bristol player for her third international try. England extended their lead when a superb cross-field kick from McLean was safely gathered by wing Thompson who went down in the corner. A conversion and penalty from the captain made it 21-3 at the break. The home side started the second half strongly and the power of the forwards allowed Hemming the space to cross again. Both sides were reduced to 14 players, with first Canada's Karen Paquin and then England's Burnfield sent to the sin bin. A fifth penalty from McLean made it 32-3 with 15 minutes to play and despite a late push from Canada, England secured a comfortable win. England: Amber Reed (Bristol), Lydia Thompson (Worcester), Abigail Chamberlain (Richmond), Rachael Burford (Thurrock), Michaela Staniford (Wasps), Katy Mclean (Darlington Mowden Park Sharks), Natasha Hunt (Lichfield); Claire Purdy (Wasps), Victoria Fleetwood (Lichfield), Sophie Hemming (Bristol), Tamara Taylor (Darlington Mowden Park Sharks), Rowena Burnfield (Richmond), Hannah Gallagher (Saracens), Marlie Packer (Wasps), Harriet Millar-Mills (Lichfield). Replacements: Emma Croker (Richmond), Rochelle Clark (Worcester), Sasha Acheson (Bristol), Rebecca Essex (Richmond), Margaret Alphonsi (Saracens), La Toya Mason (Wasps), Ceri Large (Worcester), Ruth Laybourn (Darlington Mowden Park Sharks).